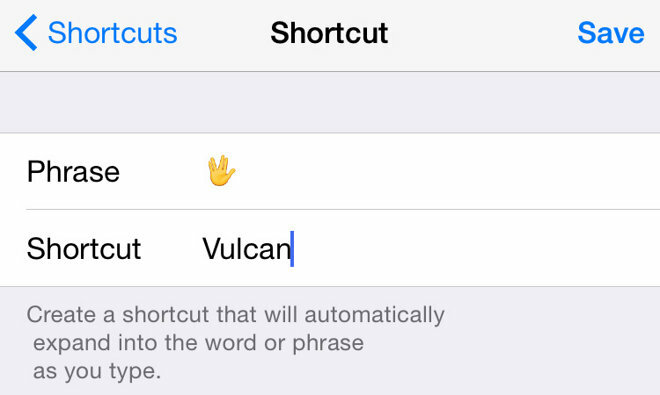 The Vulcan salute was not included as part of Apple's new emoji pack released with iOS 8.3 on Wednesday, but support for the special character does exist at the system level, meaning it can be used as a standard keyboard shortcut option. To get the emoji on your iPhone or iPad, visit this tweet on an iOS device running iOS 8.3. Tap and hold to highlight the text, adjust to select the Vulcan salute character and tap "Copy" in the contextual pop-up menu. Next, visit device Settings > General > Keyboard and click on the Shortcuts option. Apple's iOS lets you create text shortcuts for commonly used phrases. For example, typing in "omw" turns into "On my way!" In the Shortcuts pane, click on the "+" icon at the top right corner to add a new phrase. Since you already have the Vulcan salute emoji copied to Clipboard, tap and hold or double-tap inside the Phrase text box and select "Paste." You can enter in any suitable recall phrase as a Shortcut, like the "vulcan" example provided above. Tapping on Save will store the shortcut for later use. 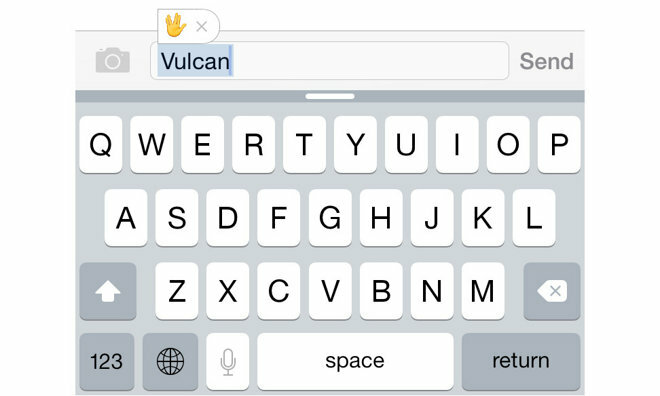 Now, when you type "vulcan" (or your preferred recall phrase) in virtually any app, iOS will change that text into a Vulcan salute emoji. If you're using a Mac running OS X 10.10.3, visit the tweet above and perform the same copy procedure. In the System Preferences menu, click on Keyboard > Text and click on the "+" symbol to add a new text shortcut. Double-click in the space provided under Replace and type in your recall phrase, then paste the Vulcan salute in the With column. Emoji from AppleInsider on Vimeo. Users beware that recall phrases apply to folder names as well. 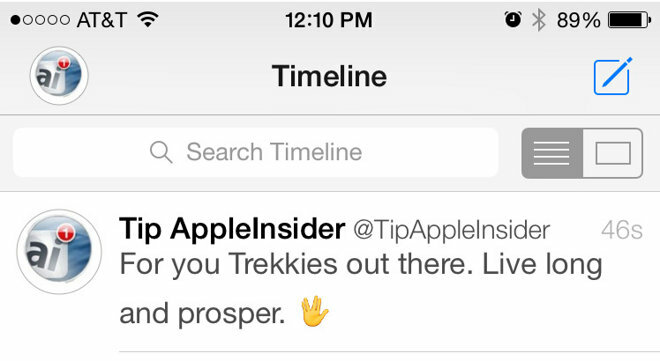 Only users running iOS 8.3 are capable of seeing Apple's Vulcan emoji. Those still on iOS 8.2 or below will see the character replaced by an alien emoji, while Mac users running OS X 10.10.2 or below get an empty box.